In regions difficult to access and far from Nepalese towns and suburbs, such as Mustang, access to medical care and education remains eminently problematic, to such a point that the population are now trying to emigrate to other regions. Female children and young girls are in general rarely sent to state schools, emphasising the harm that the absence of education and training imposes on them. The priority aim is to promote the education of young girls and nuns through a monastery which in particular has this vocation, and above all because there is a great demand from the population of the town and its environs. In the past, monasteries for nuns already existed in different parts of North Mustang and thus enabled young women to access knowledge; unfortunately these spiritual training centres are now in ruins. Also, the Rajah of Mustang, as well as the population, will be delighted if in the future this ancient tradition can flourish again. Further, such an initiative will contribute to the safeguard and protection of the cultural patrimony, menaced in this ancient little Kingdom, and the exceptional Tibetan tradition that it continues. Thanks to donations, a first school destined for nuns has opened in Tsarang. This school is the only one in the North Mustang district. Since then, it is very fortunate that two new schools have been opened in Namgyal as well as in Garphu. The niece of the Rajah of Mustang, Maya Bista, is implicated in the creation of the school in Tsarang; she also directs the “Village Development Committee (VDC)” of Tsarang and was elected by the village community. At the last count there were 30 young girls between 7 and 19 years enrolled in the school, which involves school attendance for ten years at primary school, then secondary school. During 2017, only 23 children were admitted to the school. As many parents resident in the villages around Tsarang also wish to send their young girls to school, it was rapidly decided to create a Boarding School. In this way, young girls from further away from Mustang can now have access to school. The lessons usually start at 8 am and end at the beginning of the afternoon, and are conducted by three teachers. 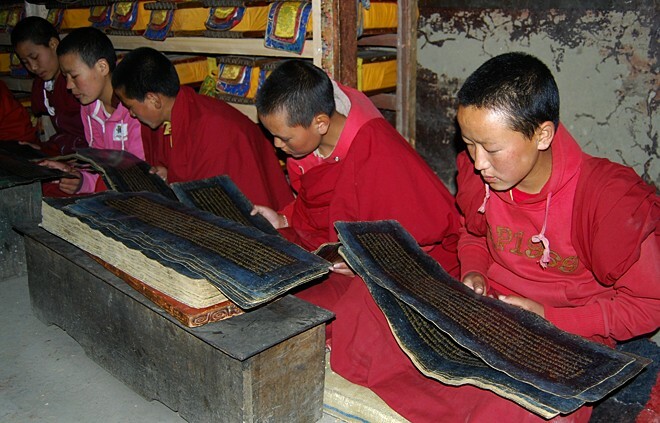 The young girls learn to read and write in Nepali and also Tibetan, so that they can understand and recite traditional texts translated into Tibetan. They also receive basic training in mathematics, geography, history and also the English language, in a manner to allow them ultimately to have access to higher education. People wishing to support the Nuns’ school through a sponsorship are very cordially invited to give for example a sum of 360 Euros, which corresponds to the annual cost of the schooling of a young girl. But any other sum is also very welcome. Since the young nuns do not all have a sponsor, all the donations are regrouped so as to finance training, costs of pedagogical materials, equipment, clothing, etc.